← Tom’s First Day of Pre-K. 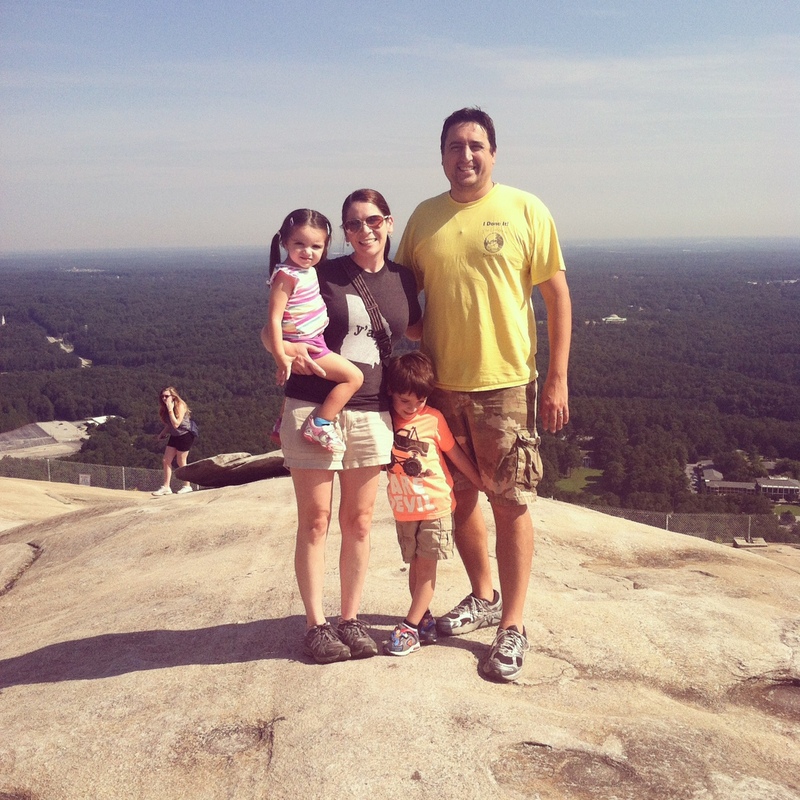 The weekend before the kids had their first day of school, we woke up on Saturday and decided to visit Stone Mountain Park. It was a spur-of-the-moment, last-minute decision without any planning at all. Have you ever had one of those days where every single thing you decide to do at a new place just happens to be right? We got in the right ticket lines. We walked right on to the SkyRide. We met the nicest people on top of the mountain. We went to a great lunch spot with no line. And after lunch, the train was just sitting there waiting for us. It was just an insanely awesome day that I couldn’t have planned to work out like that. The kids had the best time. 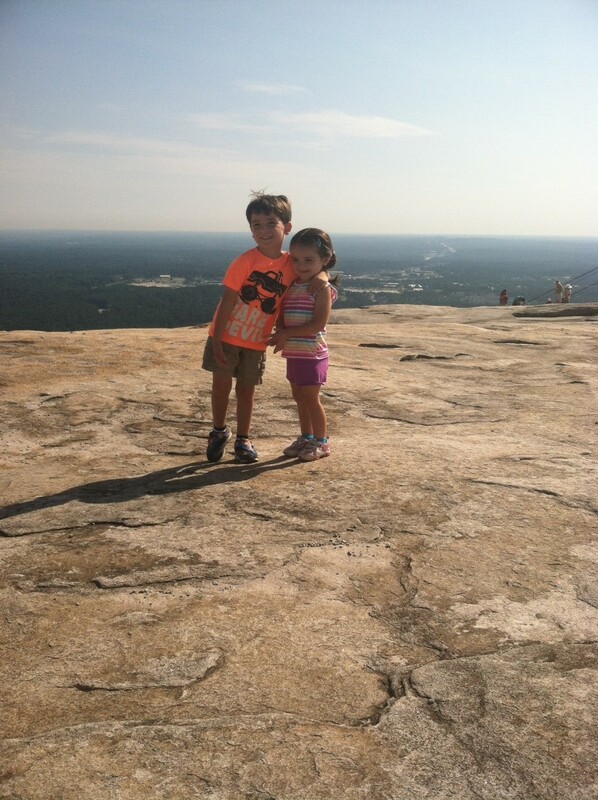 They were totally in awe of Stone Mountain. We took the SkyRide to the top (and then later, back down again) this time. I was a little nervous *they* would be a little nervous — but, no! They’re brave! View out of the SkyRide! So neat! It all happened so fast (the getting of tickets, and then walking right on) that I’m not even sure my kids knew we would end up on top of a mountain! He was good to go after he saw what it was, and that he wasn’t going to fall off. She immediately started running up there. RUNNING! 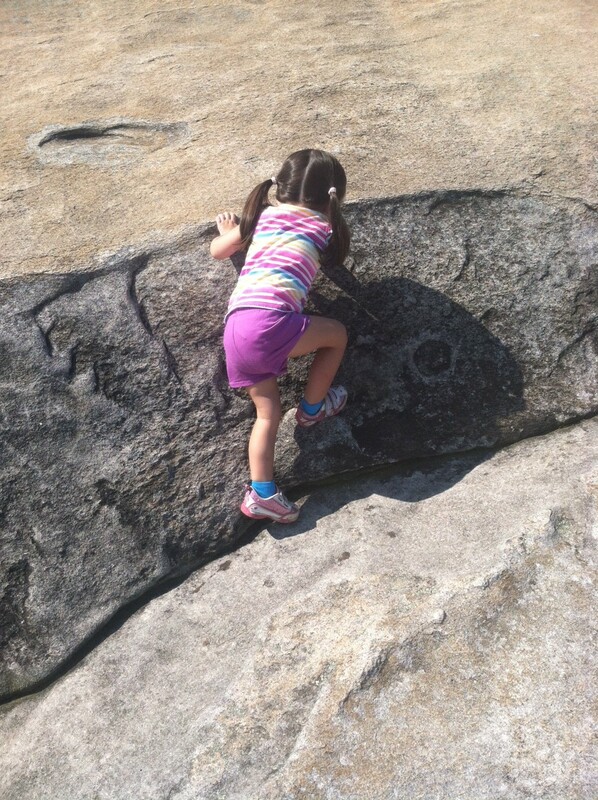 She’s literally climbing Stone Mountain. We’d been up there about 3 minutes at this point. LOVED! It was really, really fun and neat to be up there with the kids! They just thought it was the best. They were pointing out water towers, and the city, and all sorts of things. They were fascinated. I asked Alice to pose and she came up with this gem. Love. There are some small pools of water up there from rain — and they have teeny shrimp swimming in them. Isn’t that totally bizarre?! The kids loved that. And someone had set up some rocks in one of the pools, that were clearly placed so you could walk across them without getting wet. Tom wanted to try it. And then he thought out every step. Taking his time. He was timid sometimes, and wanted help, but Kevin just kept encouraging him to try it. And he did it! With only a little bit of wet shoe. After Tom did it, Alice said she wanted to try it, and I said okay. 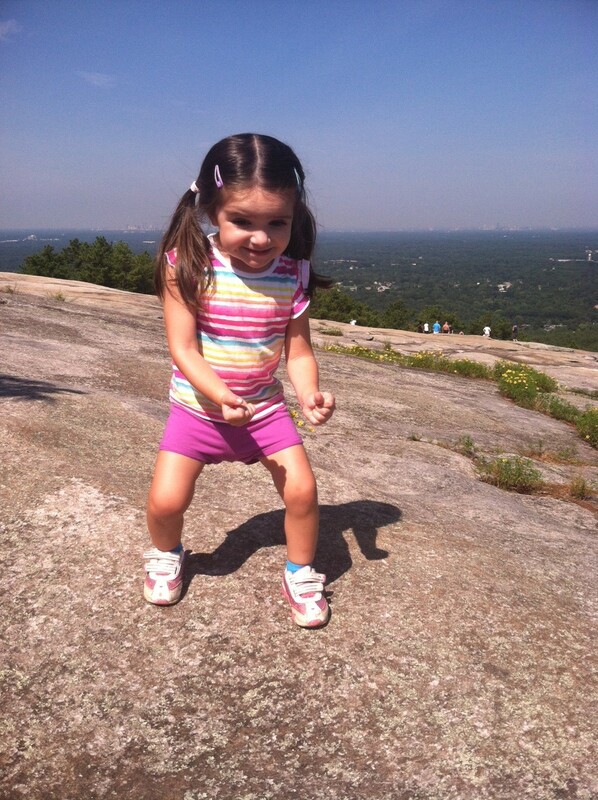 I put her on the first rock, prepared to help her by holding her hands and stuff. *I* almost fell in trying to keep up with her! It was an absolutely wonderful time! I kinda wanted to stay up there all day, but the kids were starving and apparently gummy snacks is not “lunch” so we headed back down the mountain on the SkyRide to find some food. Once we were back at the bottom, we walked across the laser show field to have lunch in the train depot area. 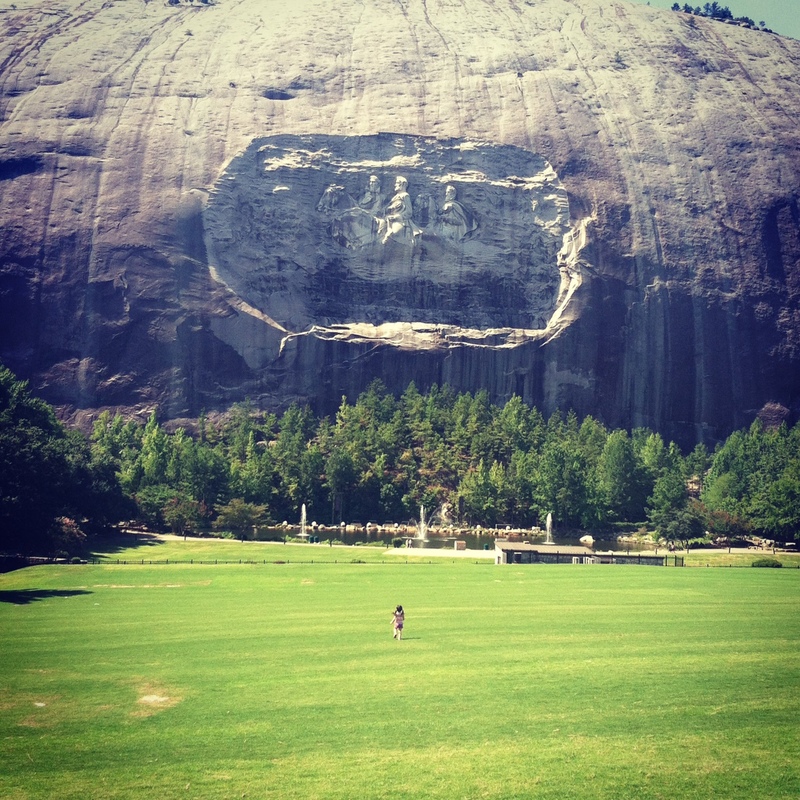 And as we were walking, I innocently asked Alice if she could run up ahead of me so I could take a picture of her in front of the mountain’s carving. And wouldn’t you know it, that girl ran and ran and ran and RAN! And then I just gave up and laughed. It was just a great moment. And so very Alice. There she goes! She didn’t stop until she reached a fence. Seriously. We ate lunch at the train depot. Tom loved it because they had a model train that went around the ceiling, and one of the employees very kindly showed him where the button was, so Tom could push it to start it. And he pushed it. Over and over and over. Tom was the only one in there who knew where the button was — and he knew it — so he took his job very seriously. After lunch, the Scenic Railroad train was just pulling up (it rolls through about every 30-40 minutes) so we boarded the train which took us around the bottom of the mountain, while a video told us about the history. 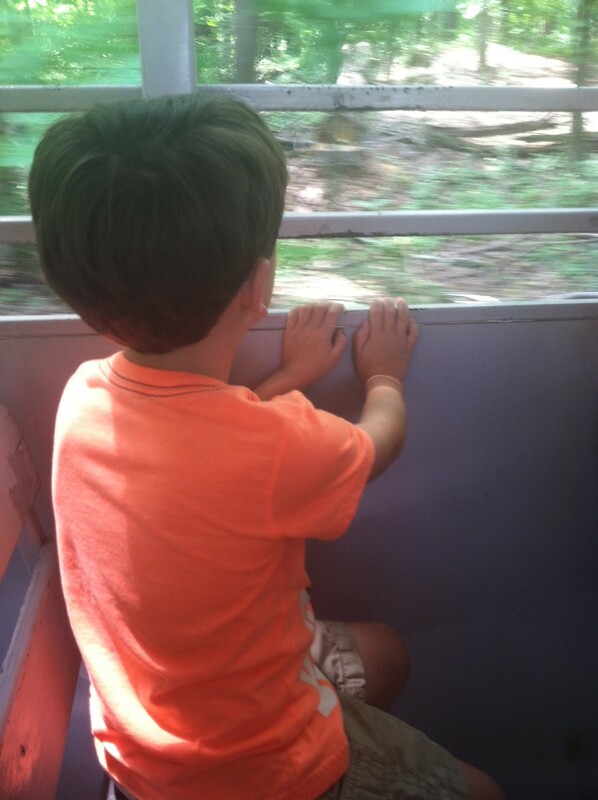 This boy loves trains! We spent a lot of time looking for caterpillar nests in the woods during this ride. It was really fun, and the kids really liked it. 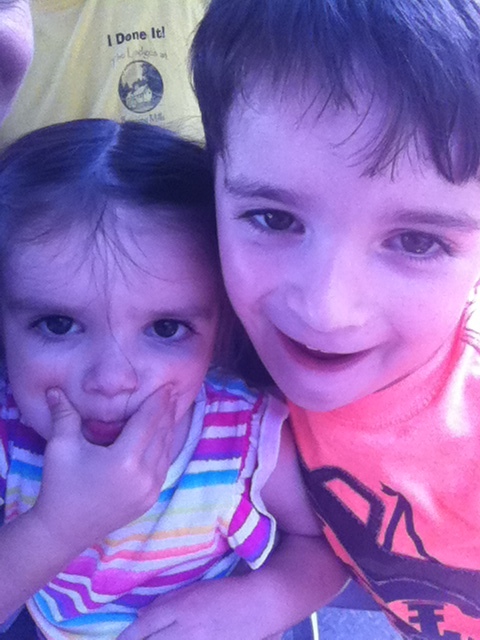 This is their “we love train rides” silly face selfie. Obviously. After the train ride, we had to head back home. And man, did the kids really not want to do that! They just had so much fun! 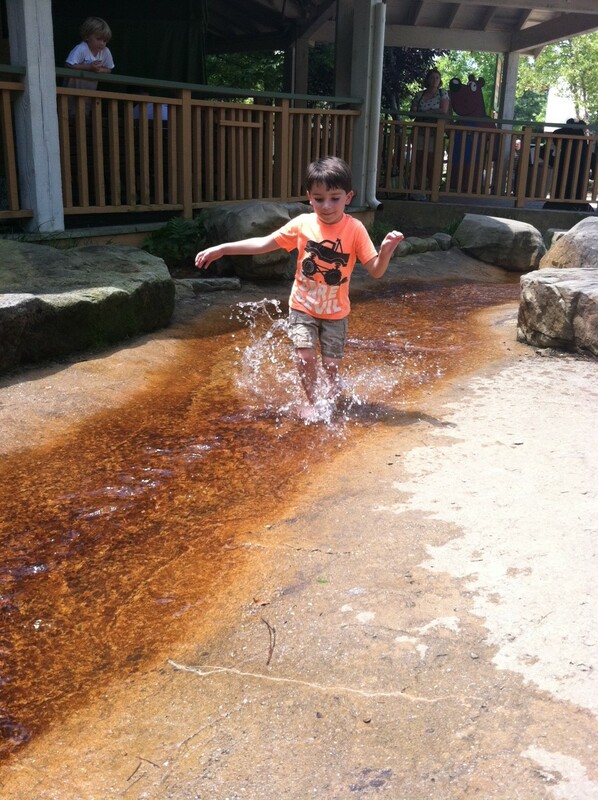 We walked through a little village area on our way out that had restaurants and shops, and one of the restaurants had this super fun “creek” for kids to play in. How neat is that? The kids just adored this! They splashed for a long time, until we had to (sadly) take them out. But they had an absolute blast! We only stayed for half a day (we got there around 10 a.m. and left around 1:30-2), but it felt like a full and really exciting day. 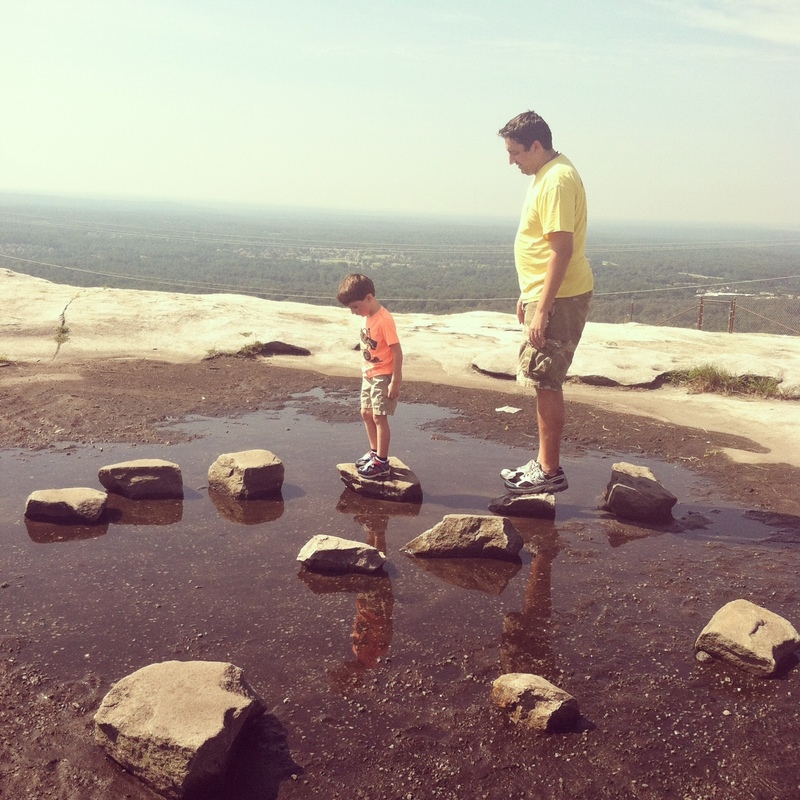 Kevin and I hadn’t been to Stone Mountain since we’ve had children, and we both agreed that we were so glad we did this. The kids thought it was the most amazing place in the world. And Kevin and I had a wonderful time, too. 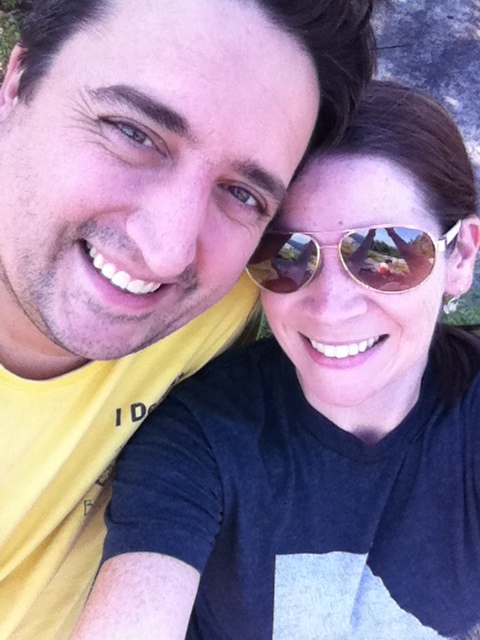 It was an absolutely wonderful way to spend our last summer weekend together. This entry was posted in Alice, Family, Kevin, Motherhood, Tom, Travel. Bookmark the permalink. 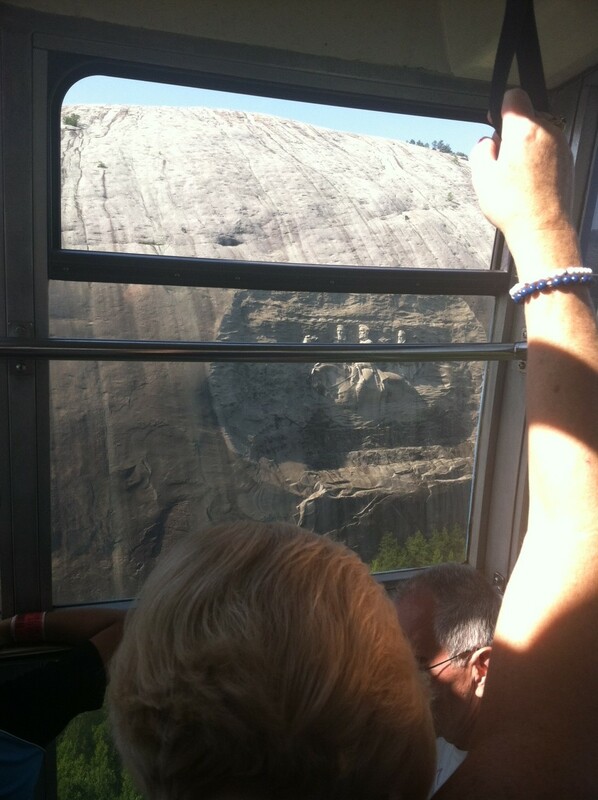 2 Responses to Stone Mountain Park. Alice’s pose is The Best Ever. I’m crying. Best. Ever. Right? That girl is hilarious.